Peacefully nestled in the plentiful and verdant hills of Sai Kung, known to city dwellers as the “Back Garden of Hong Kong”, this 4550sqft house is completely remodeled to create a spacious, stylish and tranquil living space for its owners. The Designer transformed an impractical and cramped split- leveled into a four-storey home incorporating a garage, a large living room, a family room, two small ensuite bedrooms, two guestrooms with one guest bath, a helper room, a master ensuite bedroom with a spacious walk-in closet and den, as well as an open roof top sitting area with spectacular sea and garden views into the design. In designing this house, the Designer intends to not only enhance the visual and ambient augmentation of interior space, but also seeks to optimize and harmonize its use as both a comfortable home as well as a welcoming hub for social gatherings. Being a cordial host to house parties, the owner wants to provide ample space for his guests. The full ground floor stretches from the entrance out to the backyard deck and is separated by a large set of foldable glass patio doors overlooking a 5 meters long swimming pool. As opposed to the ordinary, the Designer cleverly extended the fully equipped open kitchen downwards, creating a clutter free design yet perfectly fitting out all the essentials. The dining table is hidden at the floor level and can be elevated when required to further enhance space usage. 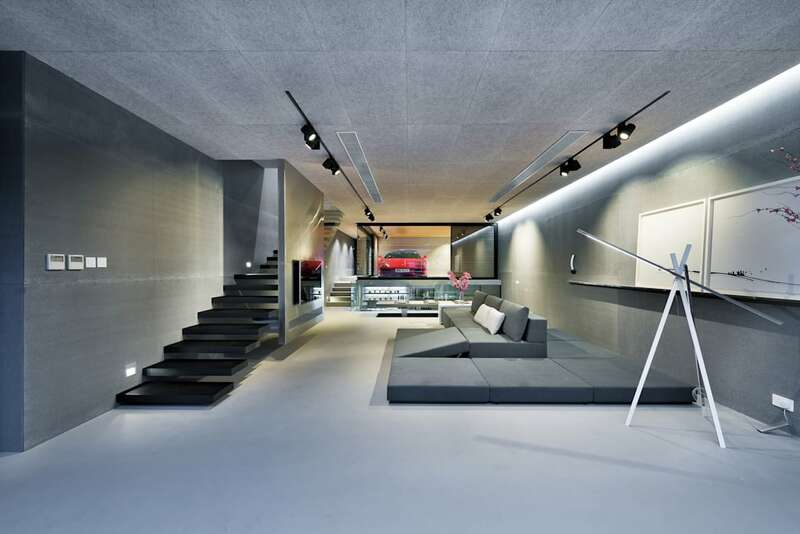 A contemporary and hip indoor glass garage design adds edge into the home’s raw and stylish finish. To conclude, the design of this house is practical, aesthetic and conducive to its intended purposes in improving the overall lifestyle of its owners.